In Germany, International Women’s Day plays a rather subordinate role, even though two German women proposed the first women’s day in 1910. Nevertheless, I personally think that having an International Women’s Day, where we specifically look into gender equality and women’s rights, is an important observation we should not miss. In her speech at the UN headquarters in New York in September 2014, Emma Watson, ambassador of the UN-campaign “He for She” declared that up till now there is not a single country in the world which has achieved gender equality. For me personally, I grew up in a world where it was never a question that I could achieve as much as my male counterparts. I was never limited in my education just because I was a girl. However, even in a country like Germany, you can find inequality when it comes to questions of payment, leadership roles on company boards, and so on. That is why I am all the happier to find a different reality at work in Rotaract. 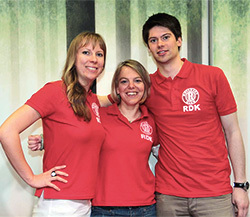 Nearly 50 percent of all Rotaract members in Germany are female and women are free to advance to leadership roles at every level including club, district, and regional. Becoming my district’s Rotaract representative allowed me to combine forces with around 250 Rotaractors to motivate them to do good in the world. We have started a very successful project collecting bottle caps to provide health insurance for children in Ghana. While I served as vice president of the European Rotaract Information Centre, I was asked by a Rotary member how it was possible so many women were serving in leadership roles in Rotaract. I came to two conclusions. First, for Rotaract members, it does not make a difference what gender you are as long as whoever is leading is doing a good job. And second, no one is afraid, male or female, to take responsibility and accept the challenge to lead. The challenges we face – saving mothers and children, supporting education, promoting peace – are huge. However, I believe that together we can achieve more. I would like to encourage everyone, male and female, to take action and make it happen! This entry was posted in Empowering youth and tagged International Women's Day, Rotaract, women by Rotary International. Bookmark the permalink.